“The Jewell Theatre – SNOW” is an installation within the LEA Program and can be visited until June 30th. It was buildt by Fake Jewell and her group of artists, the Jewell Theatre. The Jewell Theatre run their own homepage “The Jewell Theatre“. They perform live, full length plays in Second Live. Each production brings a real theatre experience to audiences whilst embracing the opportunities a virtual space provides. The performance SNOW is on Saturday, June 9th at 3:00pm and on Sunday, June 10th at 12 noon (PST). The theme of the sim and I assume as well the subject of the performance is the destruction of the earth by the mankind, be it climate, forest or wildlife. The sim should give us an impression of how a destroyed planet might look like. There’s just ruins left over, it is cold, foggy and surreal. The main place is surrounded by ruins. 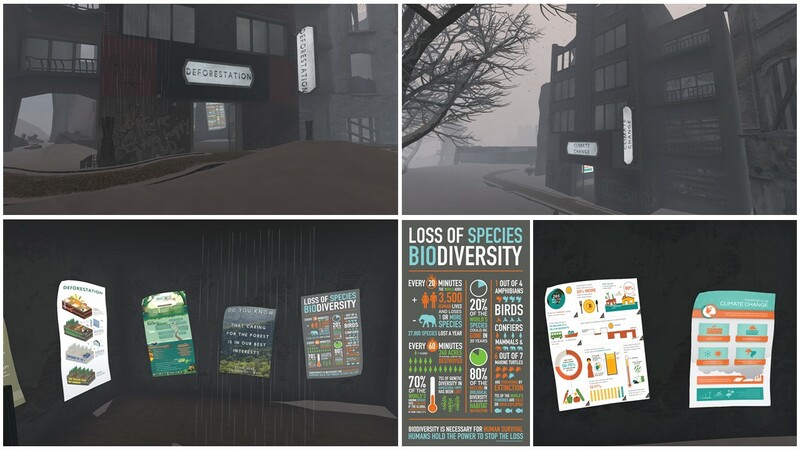 Three of the ruins contain theme rooms about decorestation, wildfile and climate change, there are boards with graphics and facts and when you click them you can either download the graphic or get more information or are led to a youtube video. “The Jewell Theatre – SNOW” is an educational Installation. 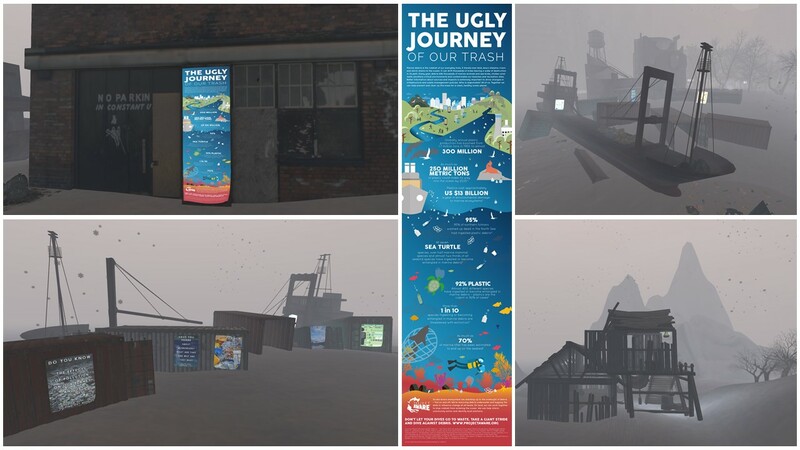 Somewhere close to the main place at the ruins of an harbour you’ll find more about plastic waste and other threats for our planet. The mankind is living in bunkers below of the surface. The entrance to the is also close to the main place. Whate else? There’s also the theatre itself where the perfomance will be next weekend and there’s a rehearsal shack. I also found a pavillion where you can leave your pledge for your personal contribution to save our planet. “The Jewell Theatre – SNOW” impresses with it’s grey and white atmosphere, that shall provide a picture of how our environment might look like in a not too far future if the mankind doesn’t stop the destruction of the planet earth. There’re a lot of facts and figures you can get by every board to enhance your knowledge about environmental issues. 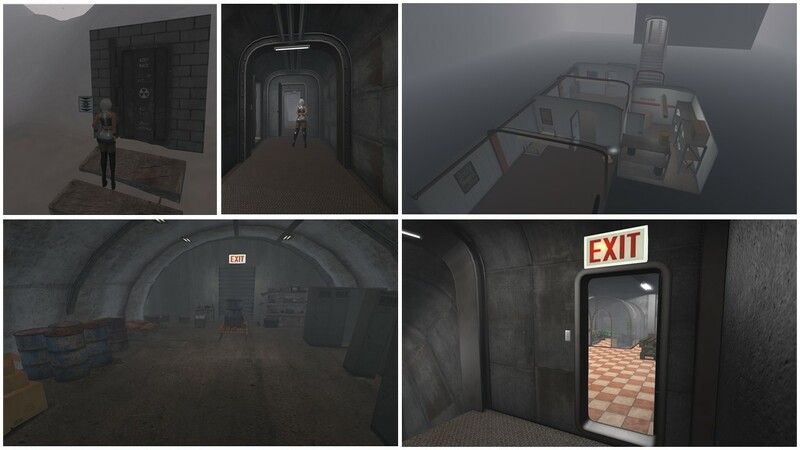 Thank you Fake Jewell and The Jewell Theatre for this educational sim and good luck for the performances June 9th/10th.